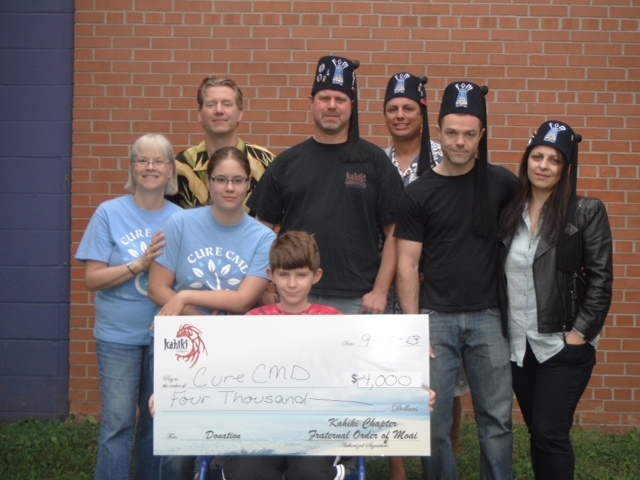 On Wednesday, September 25, 2013, The Kahiki Chapter of the Fraternal Order of Moai, presented Cure CMD with a charitable donation in the amount of four thousand dollars. This donation was raised by the Kahiki Chapter through the revival of their event named the “Hot Rod Hula Hop." After five years lost at sea the Hot Hod Hula Hop returned to Columbus, Ohio, August 9-11, 2013, and will be held annually. Presented by the Kahiki Chapter the event offered three days of events with a little something for everyone starting with the Feast of the Tiki Gods at the Grass Skirt Tiki Room with entertainment by Francis Lacuna. Before, during, and after the feast everyone enjoyed cocktails outside with entertainment by Roland Remington and the End Times Spasm Band. The evening ended with a signature Fraternal Order of Moai Mystery Bowl Auction to raise donations for Cure CMD, the designated charity for the Hot Hod Hula Hop 5. After some post-feast rest festivities resumed Saturday afternoon at the Sequoia Pro Bowl. For the low, low price of free anyone could attend the afternoon events including the car show in the Concrete Jungle, the immense marketplace on Vendor Beach, and a special performance by Lucky the Painproof Man. Raffles, contests, hot tunes spun by Surfabilly Freakout, and the Retrocentrip Pinup Studios Contest provided plenty of entertainment. As the sun fell the action moved inside for a ticketed show featuring live music by Team Void, 45 Spider, ApocaLypso, The Cocktail Preachers, and Vegas 66. Laser bowling provided an entertaining backdrop to the show. Then on Sunday the even broke new ground adding a third day of entertainment with a free double feature of Blue Hawaii and Faster Pussycat! Kill! Kill! at Studio 35 theater and drafthouse. Unofficially a few people may have returned to The Grass Skirt Tiki Room for some farewell cocktails as well. The Kahiki Chapter is one of seven Fraternal Order of Moai chapters around the nation. The Order’s mission statement describes itself as the premier fraternal organization and social network for all men and women interested in tiki culture and the Polynesian pop era. The events and activities of the Order reflect their core values; Good Works, Fellowship, Preservation, Spirit, Presence, and Celebration. Cure CMD’s mission is to bring research, treatments, and in the future, a cure for Cogential Muscular Dystrophies. Cure CMD works to achieve this mission by working globally together with dedicated parent, government, and research advocates. By focusing on this mission, Cure CMD will find and fund high potential research and clinical trials. Success will be determined by clinical applications that improve the lives of those afflicted with Congenital Muscular Dystrophies. We look forward to seeing you next year in Columbus, Ohio, for Hot Rod Hula Hop 6!